Quantico actress recently posed for an Instagram selfie with Bollywood star Raveena Tandon and displayed the huge rock on her ring finger. Priyanka's ring is a high-quality cushion cut weighing around 4 carats. It looks to be somewhere around a G color, VS1 clarity which, from Tiffany & Co.
Washington DC: Global icon Priyanka Chopra recently showed off her massive diamond ring on her engagement finger at ace designer Manish Malhotra's party. 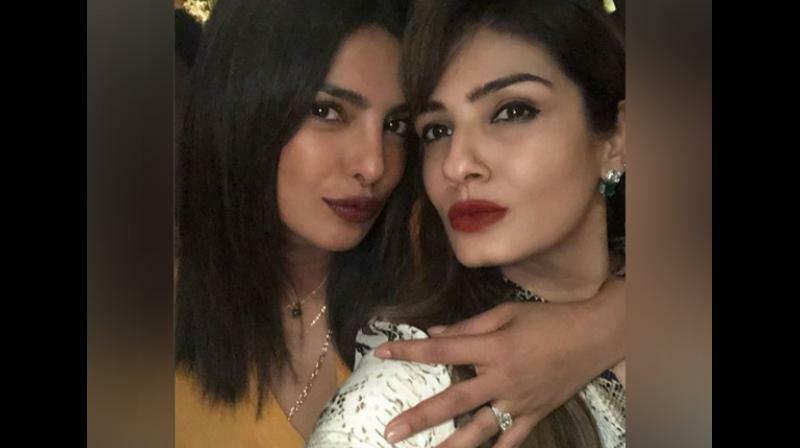 While there is still no official confirmation about Priyanka and her rumoured boyfriend Nick Jonas' engagement, the 'Quantico' actress seemed to have given approval of the same when she recently posed for an Instagram selfie with Bollywood star Raveena Tandon and displayed the huge rock on her ring finger. However, more details about the cushion-cut diamond ring have now emerged. E!Online quoted the statement of the president of a diamond company, saying, "Priyanka's ring is a high-quality cushion cut weighing around 4 carats. It looks to be somewhere around a G color, VS1 clarity which, from Tiffany & Co, would have a value of around $200,000." The news of the couple's engagement came after Bollywood director Ali Abbas Zafar said that Priyanka opted out from his upcoming flick 'Bharat' in the 'Nick' of time, owing to a very "special reason". Earlier, at two instances, Priyanka was seen hiding her ring from the paparazzi. Priyanka and Nick, who reportedly dated for two months, were first spotted together at the 2017 Met Gala. The speculation about their relationship brewed after the pair met each other's family. First, Chopra met Jonas' family at his cousin's wedding in New Jersey, after which Nick traveled to India to meet Chopra's mother. ■After hide-and-seek, did Priyanka Chopra finally give glimpse of engagement ring? Nick Jonas and family arrives in India, but is that a gift for Priyanka Chopra?